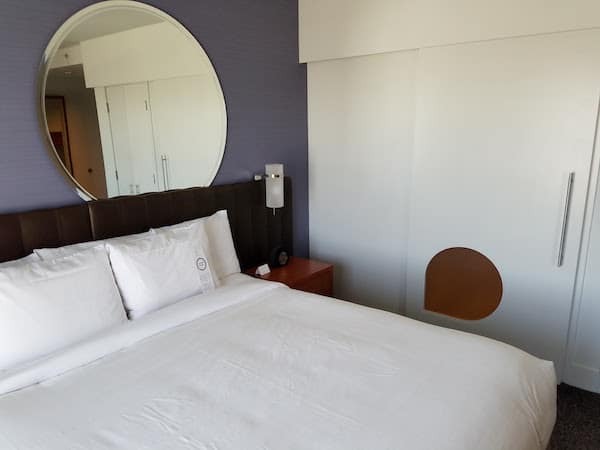 I stayed at Hyatt The Pike (review) last year before it rebranded as Hyatt Centric The Pike Long Beach. 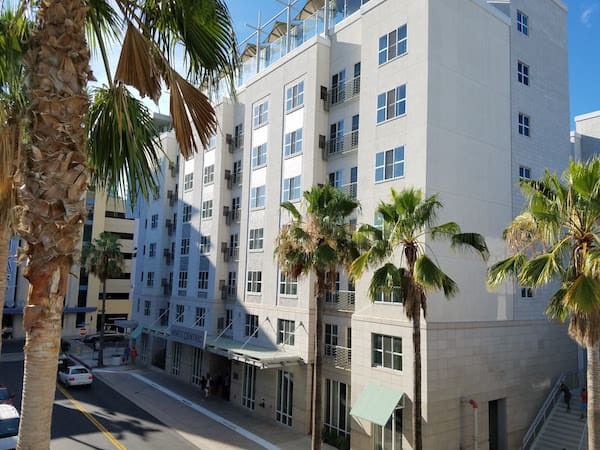 The property was originally branded as AVIA Long Beach before being purchased by Hyatt. That’s a lot of names for a young hotel. In order to get my 75,000 JetBlue points I needed a roundtrip flight. SEA-LGB happens to be the shortest route out of Seattle so I decided to spend a weekend in Southern California. 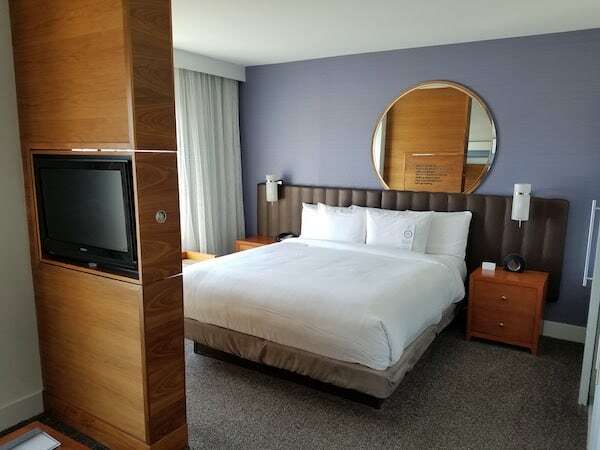 I wanted to see how the rebranding of Hyatt Centric The Pike Long Beach has gone so I booked a stay. Spoiler alert: not much has changed and that’s okay. Location: Hyatt Centric The Pike Long Beach is located near the Long Beach Marina in a shopping area known as the Pike. The area has improved since I was there just a little over a year ago but there are still a lot of empty shop fronts. As of July 2016 there is an H&M and Gap Outlet right next door and a Nike Outlet across the street. In the same complex is a movie theater, Starbucks and Cold Stone. Across the pedestrian overpass is a Restoration Hardware Outlet and Bubba Gumps. The Long Beach Aquarium of the Pacific as well as a number of chain restaurants (Hooters, Chili’s, etc) are all near by. Don’t expect much culture; this is mostly a tourist area with national chains. With that said, it is basically across the street from the marina and ocean. 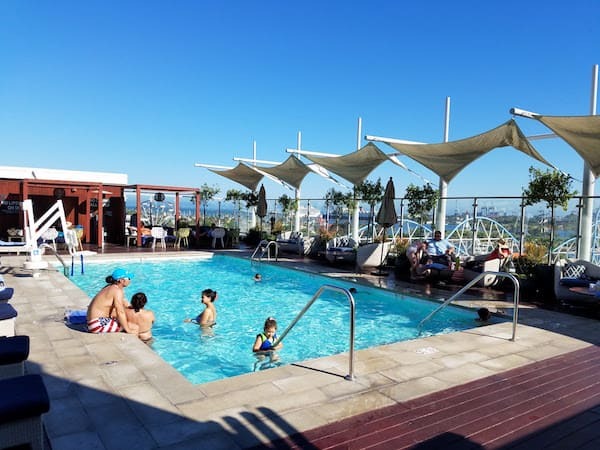 From the pool on the roof of Hyatt Centric The Pike Long Beach you have great views of the Queen Mary and beyond. Unfortunately the Nike Outlet and some empty retail space has been built up blocking most views from the rooms. Check In: Parking is next door in a large garage that services the shopping center. I believe it is $18 or so a day, but I didn’t drive this time. I arrived a bit before 4:00pm and was told my room was ready. The desk agent asked if I wanted a 2:00pm check out, which I turned down but asked why 4:00pm was not offered. She said that I was in the system as a Platinum (I’m a Diamond). However, when she looked more she said that my reservation was coded with the Diamond breakfast so she wasn’t sure what was going on. I asked about the Diamond Amenity and she said my reservation was coded for that as well. I picked the 1,000 points as the amenity offerings were pretty basic (bottled soda/water or snacks). I also asked whether or not I had been upgraded as a Diamond and she said I wasn’t and all rooms were booked. I ALSO asked about Diamond breakfast and was told I could eat in the Bay Street Kitchen or order room service. There was no limit mentioned, although I had heard it is $20. The elevators are slow. There are only two and they are access controlled so prepare to have your room key out. 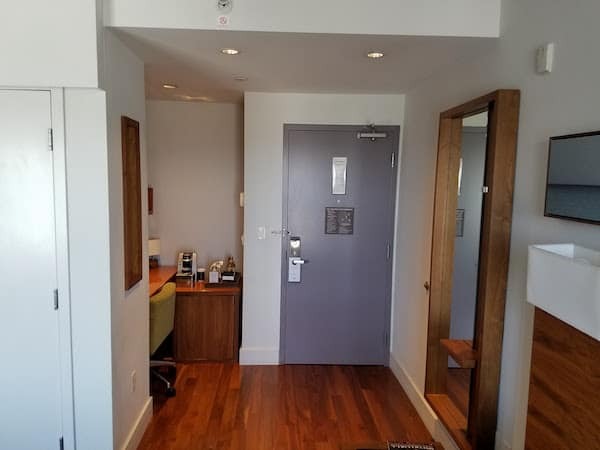 Room: Even though I was told I wasn’t given any sort of room upgrade; I was assigned to the top floor. My room, 704, was on the west side of the building facing the water. Compared to my room from last year, this was a lot bigger (it was also a King room vs a two bed Queen/Twin room). 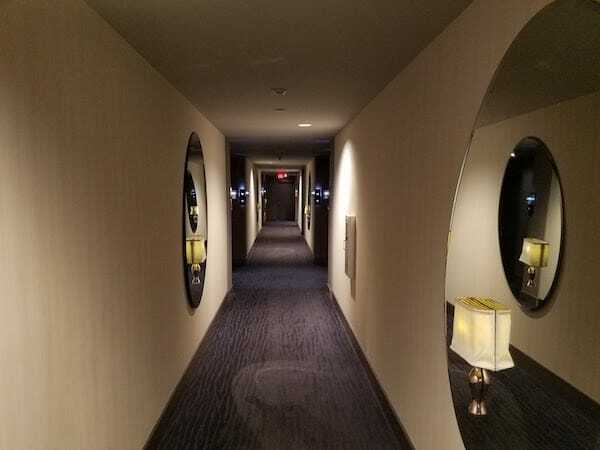 It reminded me of a Hyatt Place room with a slightly separated living room area. 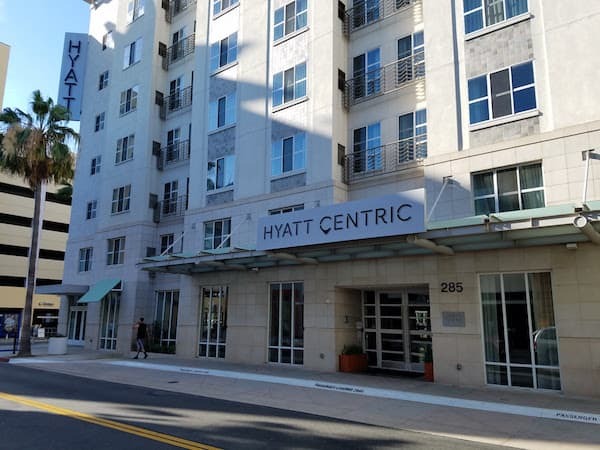 In fact, if Hyatt had originally built this property I am fairly certain they would have built it as a Hyatt Place. 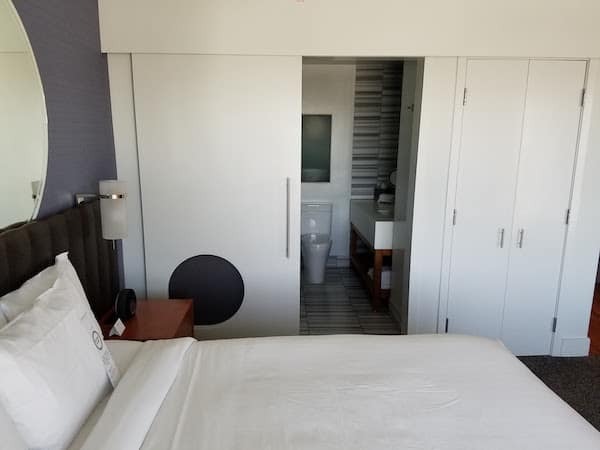 But I’m glad it is not as Hyatt Centric The Pike Long Beach is definitely a step up from a Hyatt Place. 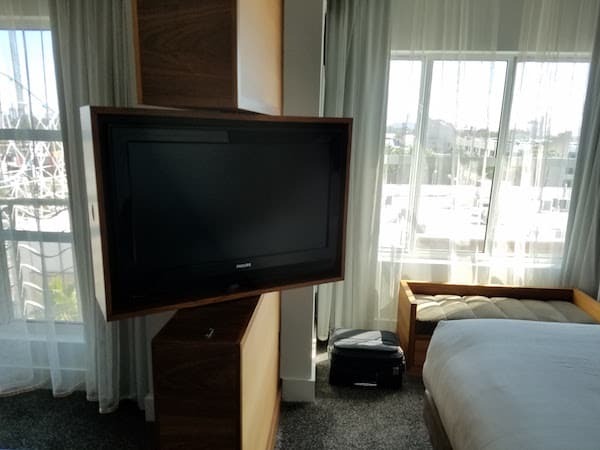 It seems that each room is slightly different at Hyatt Centric The Pike Long Beach. Your room will probably be slightly different in set up. 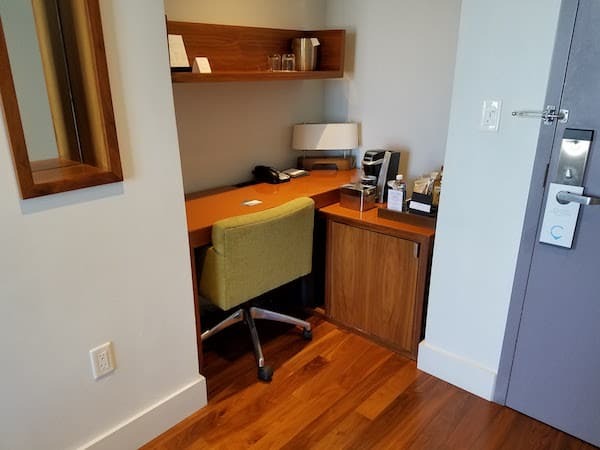 When you first enter the room there is a desk nook to the right. 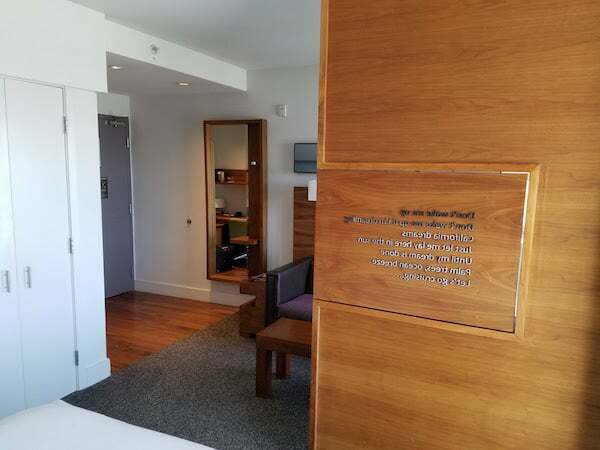 There is a mini fridge with a price list for the minibar, but the fridge was empty. 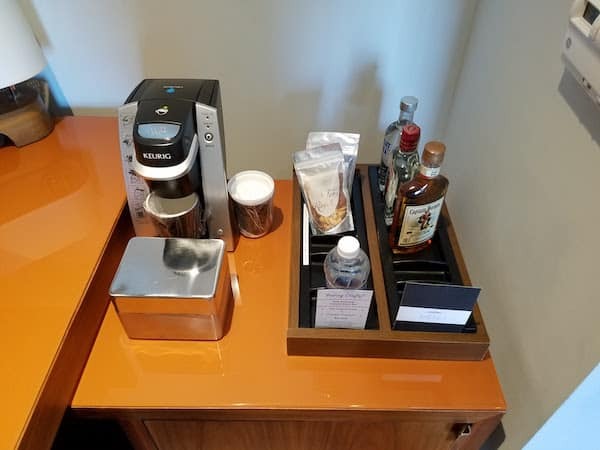 Not sure if this was an oversight or if they are moving away from the minibar set up. There were a few options for purchase but they were unrefrigerated. 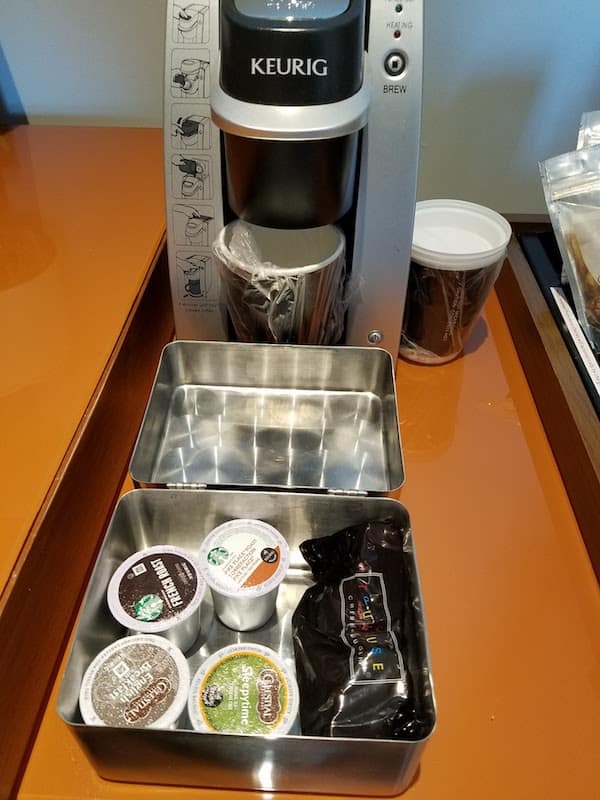 For coffee drinkers there was a Keurig with Starbucks options. Straight ahead when entering is the small “living room” area. 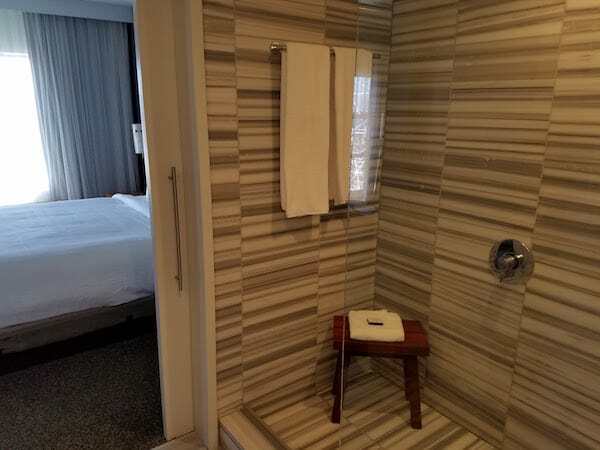 My guess is that this is standard in the “Deluxe King” rooms, a slight upgrade from the standard room. 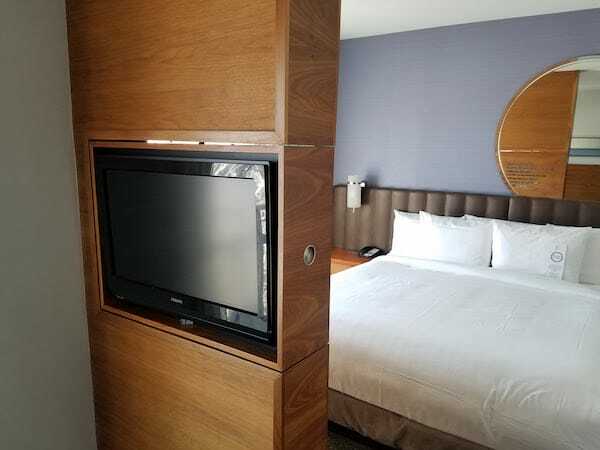 There is a small couch with a TV built into a dividing wall that can be flipped as to be viewed from the bed. The TV gets a ton of stations including HBO and Showtime. Maybe that is part of the Centric millennial focused design. 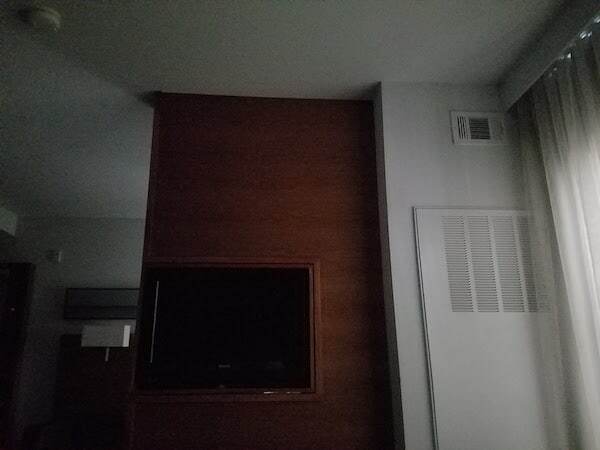 Also a neat design is on the back of the TV are lyrics printed backward that you can read in the mirror above the bed. No, my photo isn’t reversed. The bed is comfortable with plenty of pillows. Like most modern hotels they have done away with flat sheets and just have a duvet. However, the “duvet cover” is actually just two flat sheets which is just about my biggest hotel pet peeve as by morning the sheets separate and an unlaundered duvet is up against your face. There are three power outlet on each side of the bed, another nod to the millennials with multiple gadgets. 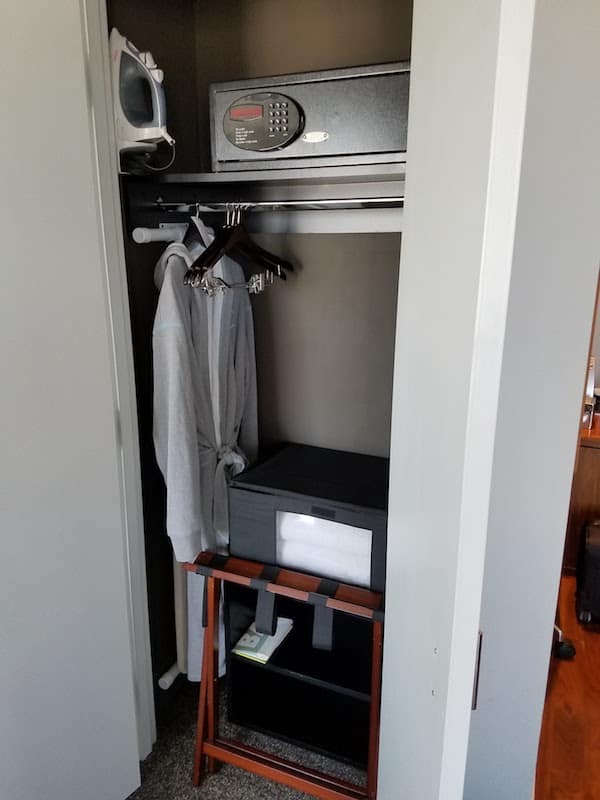 There is a full closet with safe as well as a Centric bathrobe. 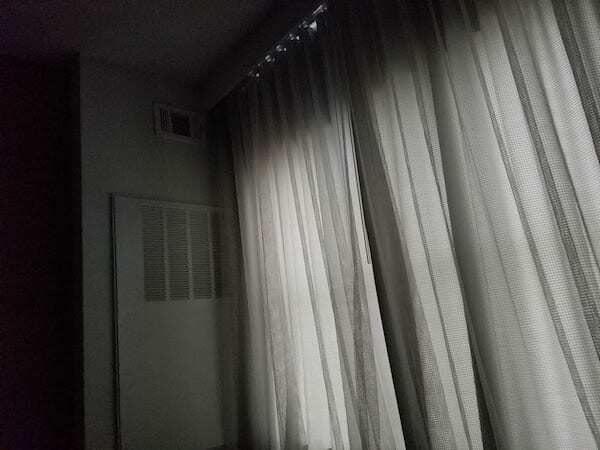 My second hotel pet peeve is lack of black out curtains. By 6:00am the room was quite bright. 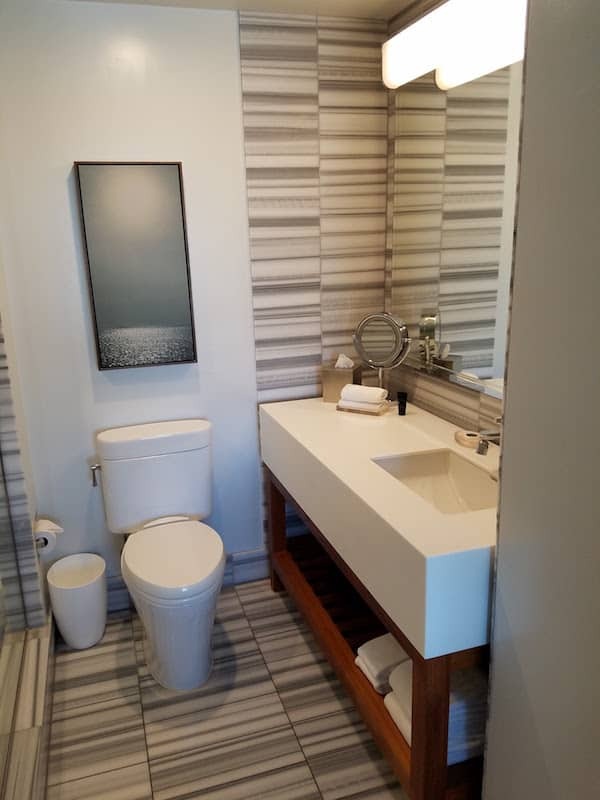 Bathroom: The bathroom of the rooms at Hyatt Centric The Pike Long Beach are quite modern and have more character than the standard Regency bathroom. Stripped marble tiles line the floor and walls. 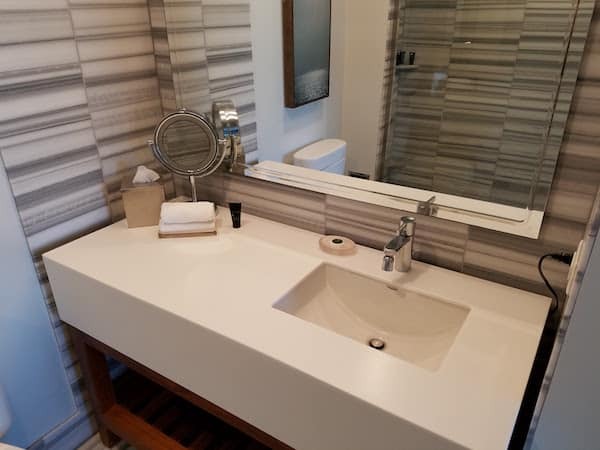 The sink is a single vanity but there is plenty of counter space. 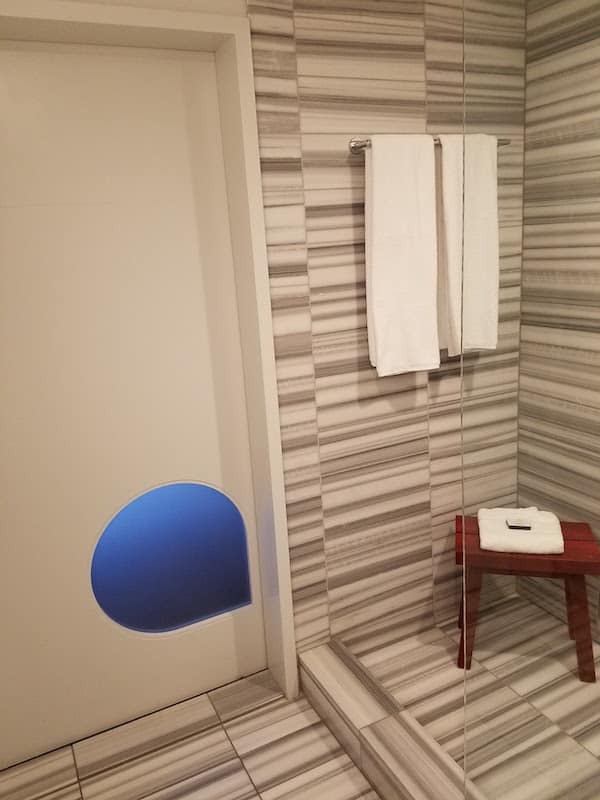 The shower has a glass wall with no door or shower curtain. It is better designed than some showers in that it is slightly raised and quite large; water escaping is not a problem. 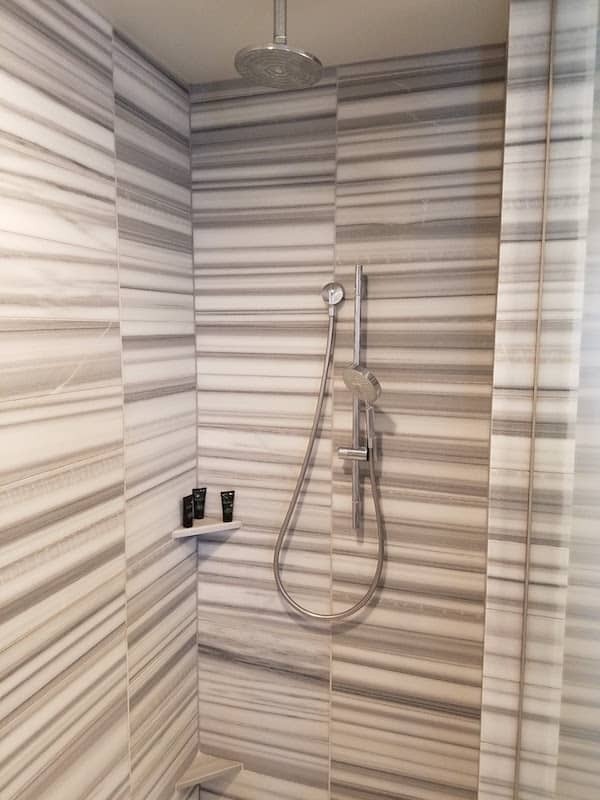 The shower is equipped with both a rain shower head and a wand. The temperature control is a bit tricky; you have to push in to adjust the temperature. Luckily it is labeled with directions. 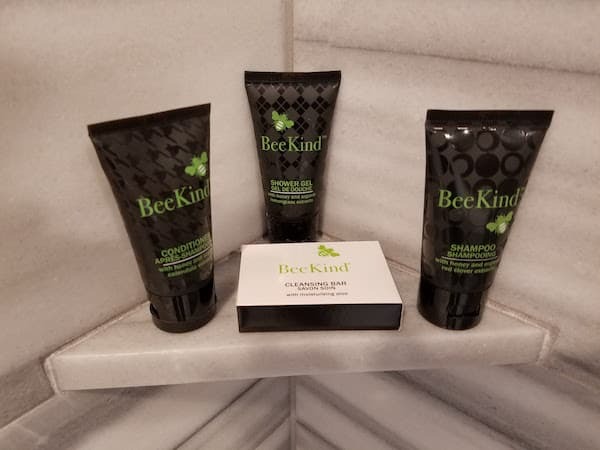 The bath products are Bee Kind and smell good. Definitely a step up from KennetMD or June Jacobs (yuck). The door is the trendy barn door sliding style with a small frosted window. It is private enough if you are sharing the room with a friend. Pool/Gym: The pool is one of the highlights of Hyatt Centric The Pike Long Beach. It is located on the roof. You take the elevator to the 8th floor which opens directly onto the pool deck. There are a few lounge chairs as well as couple of cabanas and other seating. A full bar is available that also serves limited food. There is no hot tub but the pool is quite (too?) warm. The deck area offers great views and has a nice vibe to spend the afternoon. 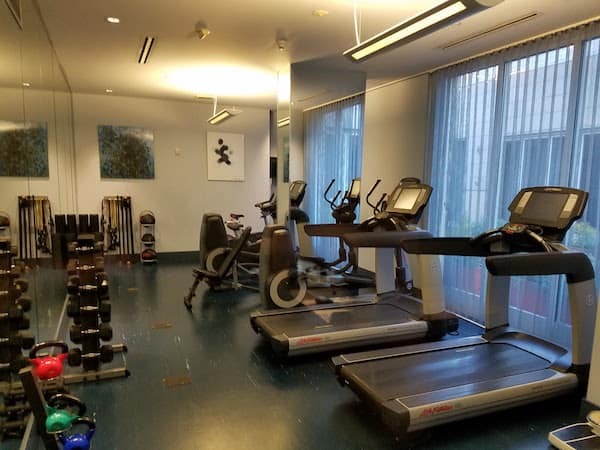 The gym is located on the first floor off the lobby and is small but when I stopped in it was empty. 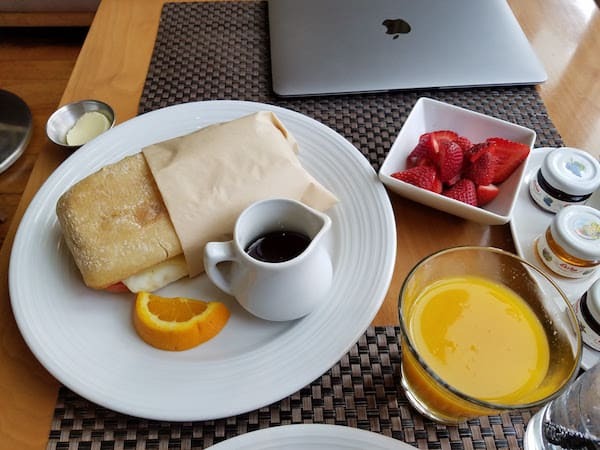 Diamond Breakfast: I chose to eat in the Bay Street Kitchen rather than order room service. It is a bright area just off the lobby and opposite the bar. I found the service to be high quality even when dealing with a false fire alarm going off. I ordered a couple things off the menu at the waitress’ suggestion. However, she only charged me for my main meal and drink. I tried to let her know but she didn’t seem concerned (maybe she knew I was a Diamond and it would be comped anyway). The restaurant offers a number of egg dishes with Mexican themes — breakfast burritos and tacos, etc. 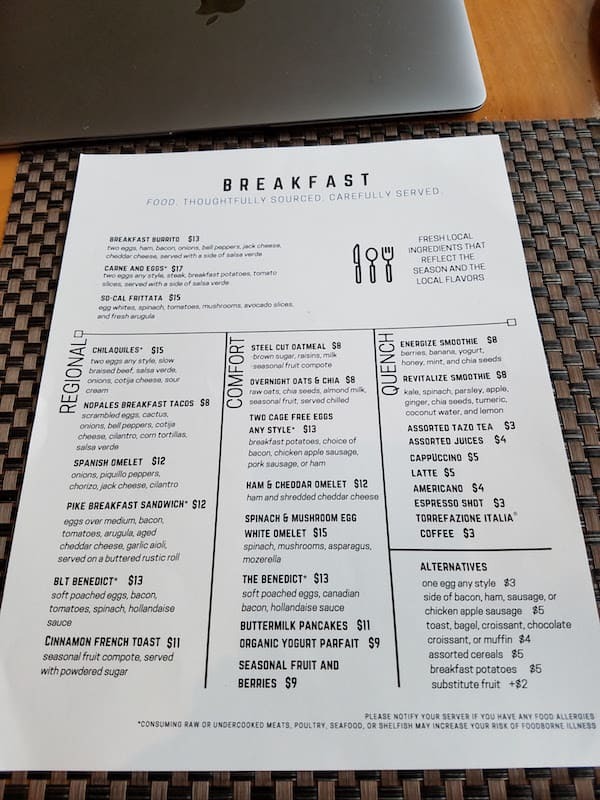 I ordered the Pike Breakfast Sandwich which was delicious with a side (kids order) of French Toast which was also good. I couldn’t finish (lots of bread) and could definitely keep me going past lunch. The bill went over $20 but when I checked out there was no charge for breakfast or tip. 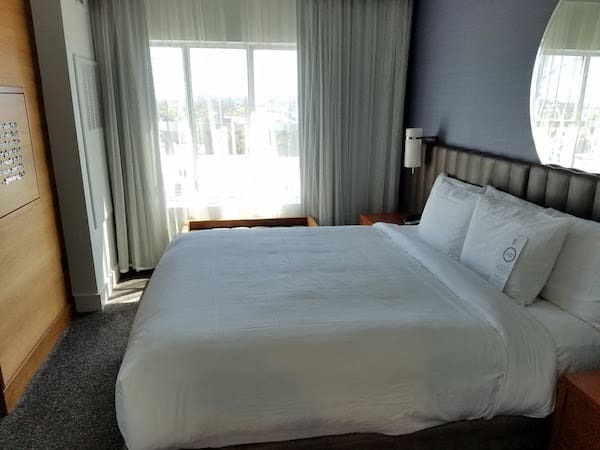 Overall: There has not been a huge change since Hyatt The Pike became Hyatt Centric The Pike Long Beach. It does make perfect sense for this to be a Centric property. 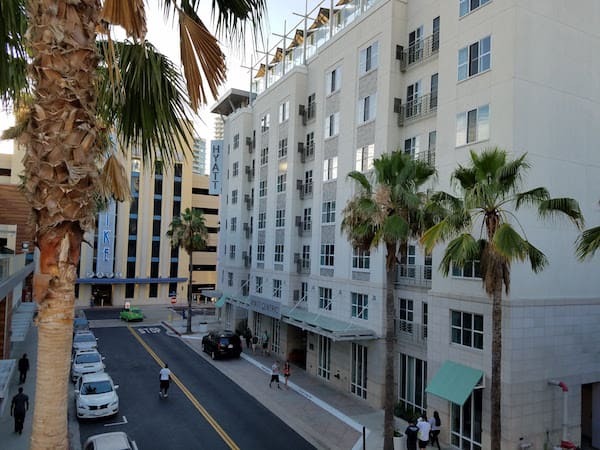 Like I said, the only other option would be a Hyatt Place but this is too “boutique” for that branding. I was tempted to try out the Regency Long Beach which is just on the other side of the shopping center and theater. I probably will next time just for variety. 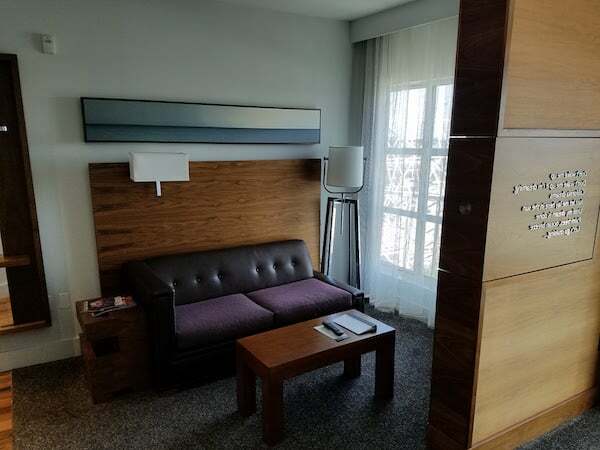 The rates are about the same (and in the same category if using points) and I like that it is smaller than the Regency (although not as good views). Also as a Diamond at the Regency you would not be able to have breakfast in a restaurant as there is a Club on site. 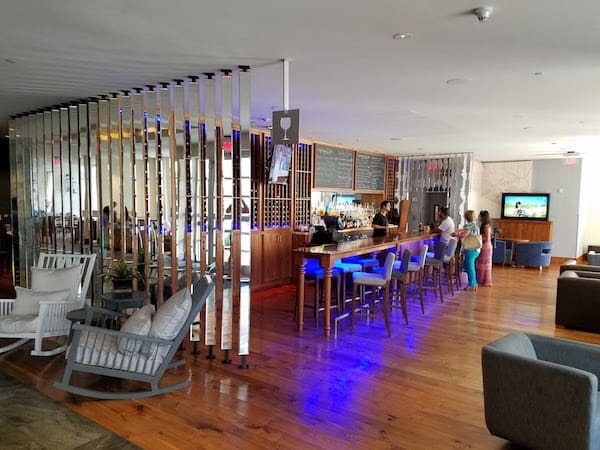 The service at the restaurant was great but every where else at the property was just okay and more like you would find in a Regency or business property. 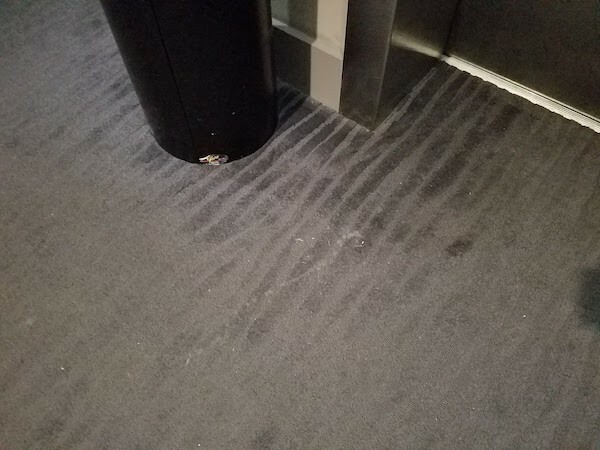 I did think the common areas could be slightly cleaner; especially on my floor outside the elevator. To me the pool is what makes this property. It is a great place to enjoy the sun on an afternoon. 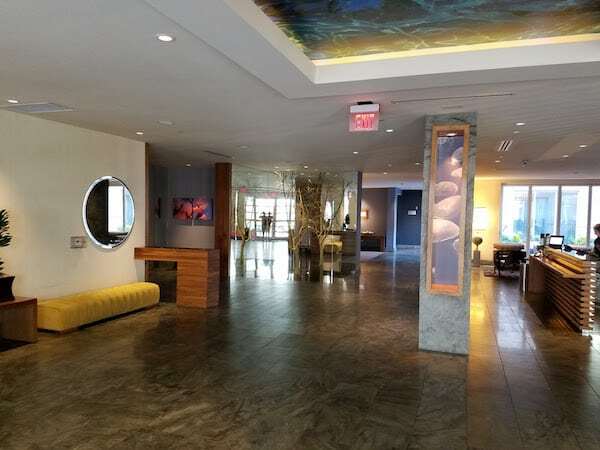 I look forward to seeing the Centric brand grow if the are similar to the Hyatt Centric The Pike Long Beach. Smaller boutique feel and less generic than a Hyatt Regency or Place.